It's almost a decade since Atomix Boats was founded and over the years we have seen the quality and finish of their boats increase to the point where they are now up there with the best local boat manufacturers. The latest model from Atomix, the 560TT, is possibly one of their finest models yet. 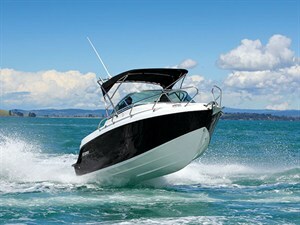 A mid-sized boat, it combines elements of their previous 550 and 600 boats. 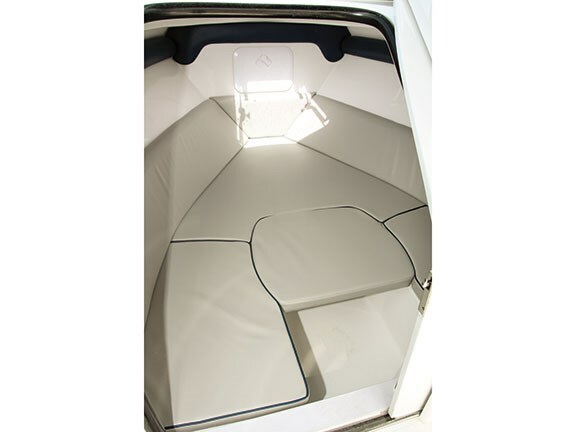 The extra length over the 550 allows the inclusion of a cabin with a lockable door. And with the overall hull length slightly shorter than the 600, this boat is more economical to operate and tow. Pushing the throttle hard has the boat leaping out the water. 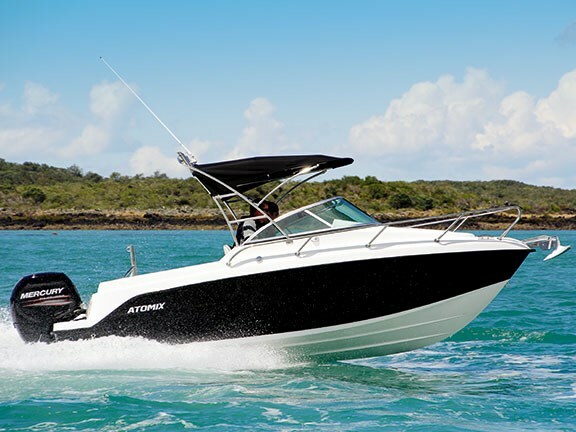 A few years ago Atomix introduced a distinctive bowed foredeck design to their cabin boat range, which is also seen in the 560TT. This extra height creates a roomy front cabin with plenty of headroom, although it does reduce the walkable area around the bow. Atomix mitigate this by adding a flat non-slip area around the edges of the foredeck, ensuring it is possible to walk around the cabin if required. The forward cabin is accessed from the cockpit through the extra-wide sliding lockable door, and features vinyl-upholstered squabs which can be configured either as a comfortable couch seat or for sleeping. Although not quite full length there is enough space for a passable overnighter. Helm seating comes on non-adjustable vinyl-covered seats fitted to a sturdy pod, which contains a dry storage compartment. The forward-opening hatch limits access to this but Atomix say they will move the hatch to the side in future. The two Mercury SmartCraft digital gauges in the centre of the dash are a mixture of analogue-style dials, one each for speed and RPM, with a central configurable LCD display for the other essential engine functions. The review boat had a modest but capable 7in Raymarine touch-screen chartplotter/sounder installed, although the dash could easily accommodate a considerably larger unit. 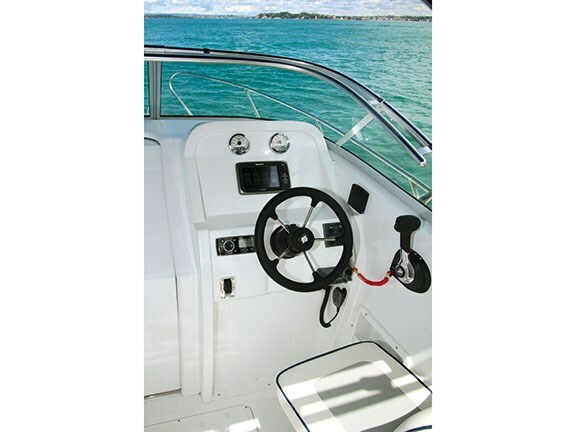 A Fusion stereo and Raymarine VHF complete the electronics while steering is managed by a hydraulic unit with a five-spoke stainless and rubber steering wheel. The cockpit has a smooth inner liner ensuring there are no corners where muck can collect. The floor does not have a carpet but the deck has a moulded non-slip surface which is both comfortable for bare feet and grippy even when wet. The only downside is the lack of parcel shelves under the gunwale. In order to maximize cockpit space the gunwales are also too narrow to sit on comfortably, although in return the cockpit makes use of most of the boat's 2.30m beam. 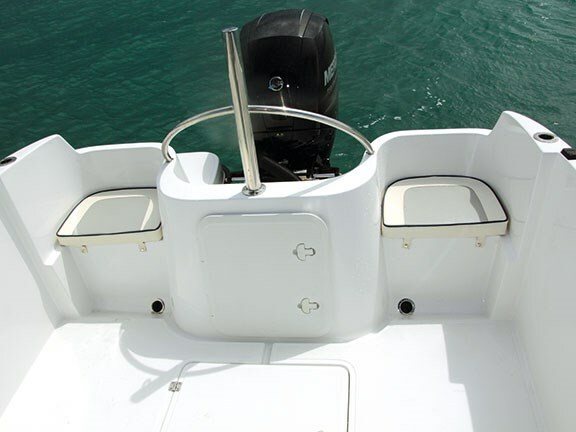 The transom has a moulded seat on each side of the outboard, each fitted with a clip-on squab. These lift up to reveal a removable plastic insert, which can be used as a live-bait tank. 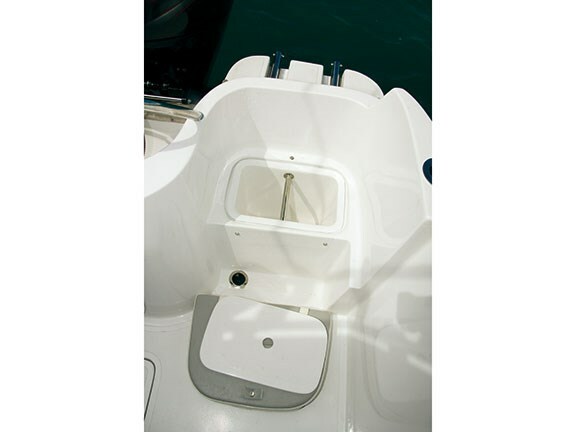 The battery, master switch, fuel filter and bilge pump are all hidden behind a hatch in the centre of the transom. Since the cockpit is self-draining, the bilge pump should have little to do, but it will take care of any water that may get in through a hatch opened at the wrong moment. The use of a full inner liner makes the interior of this boat extremely smart, while cleaning it is a simple hose-down job. What's more, foam filling the space between the hull and liner enables Atomix to achieve full CE safety certification. The foam provides buoyancy, sound dampening and further hull rigidity – at very little cost in extra weight. The stern of the boat is somewhat unusual in that the waterline continues the full length under the boarding platforms. This means that the 206kg of the Mercury 150 is supported by the hull either side, rather than jutting out the back as happens on many boats. This extra buoyancy right where the weight is located means the boat does not 'squat' at rest and gets up on the plane quickly and efficiently. The Mercury four-stroke is quiet and the foam sandwiched in the hull ensures virtually no vibration is transferred through to the hull. Pushing the throttle hard forward has the boat leaping out the water, getting onto the plane in seconds. At full tilt the boat is running easily on its planing strakes, with the chines clear of the water. In straight running the hull first touches the water roughly under the helm position, ensuring that all spray is kept to a minimum and well away from the interior of the boat. Throwing the 560 into a tight power turn brings the chines into play, gripping the water on the inside edge and keeping spray turned well away on the outside. In the fairly choppy conditions of our review day we kept remarkably dry, with only the slightest of spray coming onto the windscreen. The stability of the boat at rest was surprising, given that the cockpit floor is above the waterline. Clambering over the gunwale from the photo boat with three of us on the same side produced no more than a slight heel. This is even more surprising given the boat's 23° deadrise, but viewing the boat from the side at rest it can be seen that it sits well on the water with the chines resting just below the surface. 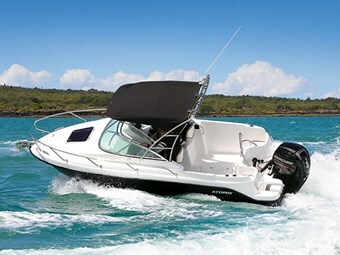 Overall this is a great family boat at a sharp price. It will do equally well as a day tripper, a modest ski boat or a potentially serious fishing machine for those on a budget. 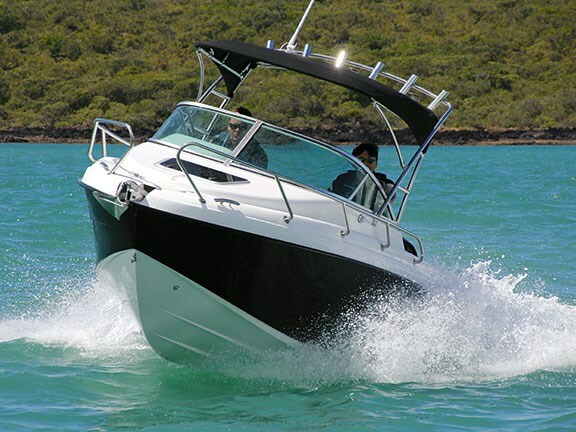 The ability to be stored in a garage or under a carport further enhances this boat's versatility.